Event on katari (narration) in Japanese medieval performing arts. Prof. Fujita Takanori from Kyoto City University of the Arts talked about two traditions still performed today: Kōwaka-mai in Fukuoka and Daimokudate in Nara. Fujita analyzed musical aspects of the chant-narration such as melody and meter. It was interesting to compare styles of chant that are thought to pre-date noh (this point is currently debated by scholars) with noh chant. Videos of training and performance were also shown during the lecture. This is rare footage as these traditions are currently transmitted only within small local communities. The videos from Kōwaka-mai are available as DVD here. In the second part of the event waki actors Yasuda Noboru (Hōshō school) and Arimatsu Ryōichi (Takayasu school) discussed narration drawing from the plays Aoinoue and Sumidagawa. It was interesting to see actors from different schools who usually do not appear together on stage (or backstage!) discuss differences in narration styles. 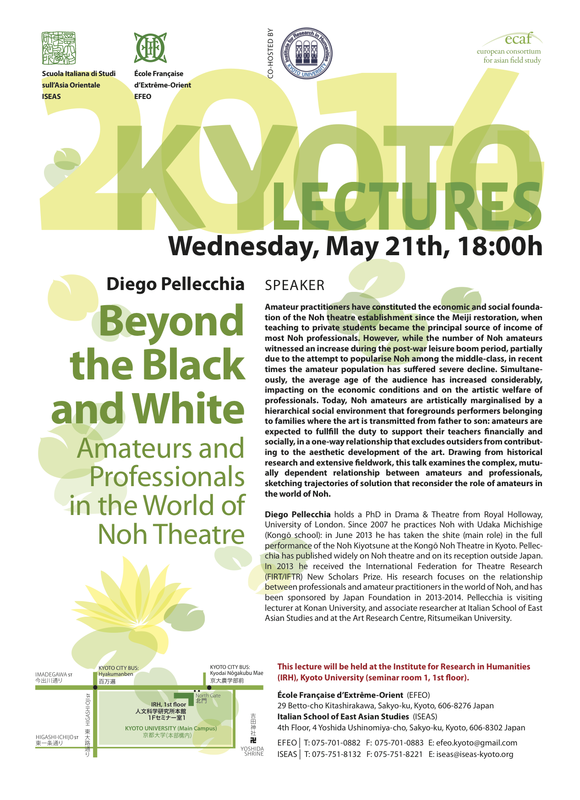 On Wednesday May 21st 2014 at 18:00 I will present my current research in an event part of the Kyoto Lectures series, organised by the ISEAS/EFEO. The lecture will be held at the Institute for Research in Humanities (IRH), Kyoto University (seminar room 1, 1st floor). Free entry, booking not required. Amateur practitioners have constituted the economic and social foundation of the Noh theatre establishment since the Meiji restoration, when teaching to private students became the principal source of income of most Noh professionals. However, while the number of Noh amateurs witnessed an increase during the post-war leisure boom period, partially due to the attempt to popularise Noh among the middle-class, in recent times the amateur population has suffered severe decline. Simultaneously, the average age of the audience has increased considerably, impacting on the economic conditions and on the artistic welfare of professionals. 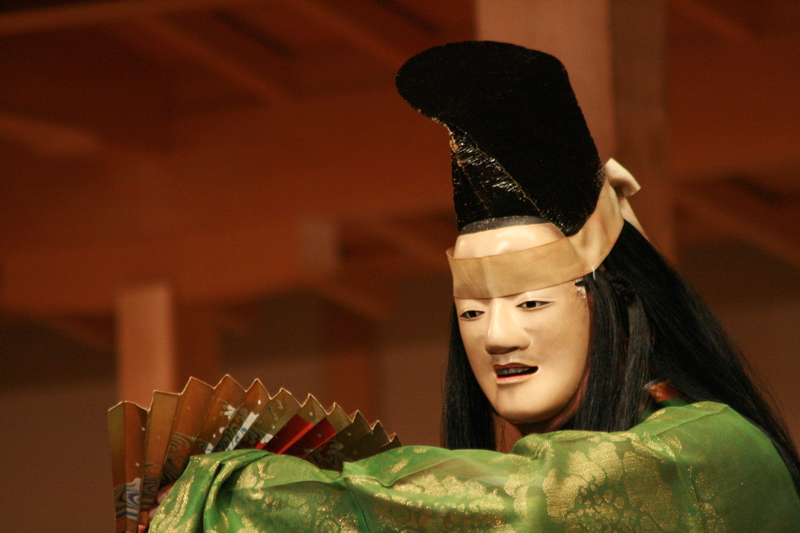 Today, Noh amateurs are artistically marginalised by a hierarchical social environment that foregrounds performers belonging to families where the art is transmitted from father to son: amateurs are expected to fullfill the duty to support their teachers financially and socially, in a one-way relationship that excludes outsiders from contributing to the aesthetic development of the art. Drawing from historical research and extensive fieldwork, this talk examines the complex, mutually dependent relationship between amateurs and professionals, sketching trajectories of solution that reconsider the role of amateurs in the world of Noh. As part of my year at the Art Research Centre at Ritsumeikan University under the Japan Foundation Fellowship Programme, I have been asked to write a brief article about my current research on the role of amateurs in the world of Noh. The article is available both in English and in Japanese on the Japan Foundation web magazine Wochikochi. Prof. Royall Tyler told me about the imminent publication of his new collection of Noh translations just a couple of weeks ago. To Hallow Genji: a tribute to Noh is an interesting Amazon ‘print-on-demand’ independent publication format (does Royall Tyler need an editor at all?) including many rare and bangai plays that fell off the current repertoire of the five Noh schools. Prof. Tyler does not really need any introduction, but for those who are approaching Noh for the first time, I would like to remind that he has published his first Noh translations in the 1970s: his Japanese No Dramas (Penguin, 1993) is an important contribution to the dissemination of Noh in the world – I think it was the first Noh book I’ve ever bought, actually. He is the author of various major essays and translations of Japanese classical literature, including his recent English translation of the Tale of the Heike (Penguin 2012). I am looking forward to lay my hands on this book. Amazon’s print-on-demand seems like an interesting alternative to the e-book format, which still needs improvement, especially when it comes to books that require columns and other special pagination and formatting.